Why I love playing Angry Birds. Back in 2011, I was recovering from a really bad accident. Lucky am I, a friend lent me her Ipad & introduced me to a game called Angry Birds. I immediately fell in love with those squawking birds & snorting green pigs. I found mental sanction in all the fun colors & cartoon designs. I also found mental help in those exploding blocks & popping porkers. 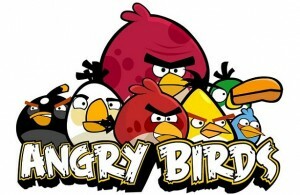 Suddenly after a month or so...America found Angry Birds too & they were everywhere. Every opportunity I get to play a tournament or just take some target practice i found myself taking out inner angst through target practice & a reapeat button. Now I find myself enjoying the technical side & finding the golden spot for most points & most damage. Whether I'm roaring in space as a puffy Chewy or flinging blue macaws for double points or enjoying a trip through a Chinese New Year, I'm a boy just playing a fun & yet challenging game. I'm also proud to say that I introduced the game to my family & helped in the mass explosionial craze for cartoon tropical birds on a vengeance against those that dare take their eggs or find feather friends.